Sometimes it’s hard to believe we’ve been punching Mario’s face in for nearly two decades. From the original Super Smash Bros back on the N64 right up to the present day with Super Smash Bros. Ultimate, furious bullying and beating of beloved Nintendo mascots has never been more encouraged. Those red and blue overalls must have hidden a fair few bruises over the years. 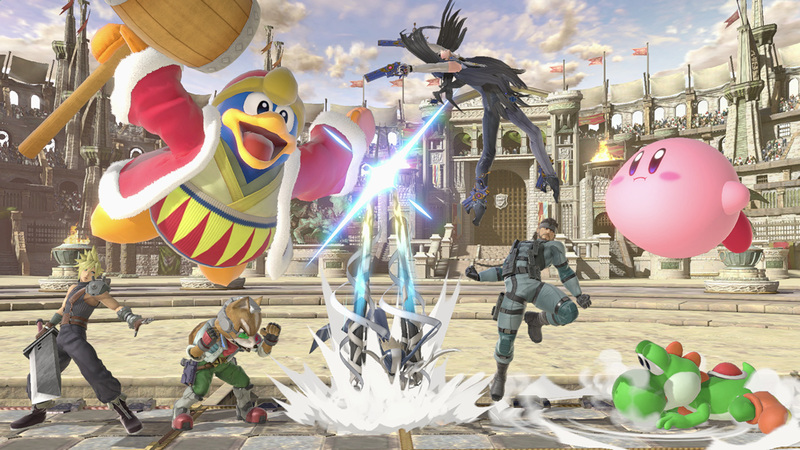 And in that time, the basic premise of the Smash Bros. franchise has remained unchanged: a cathartic, often frantic, battle to stay on-screen, while your opponents do their very best to force you off it. What sets each game apart is how well it builds on what has gone before, and how much longevity it provides before it’s left gathering dust on your shelf or languishing in the mire of your digital library. Thankfully, Ultimate brings refined, well-balanced, quality content and a flurry of new additions which create the perfect combination to breathe new life into the series. Most of the controls and mechanics have remained the same, but there are a couple of changes to the gameplay that veterans of the series will notice in an instant. 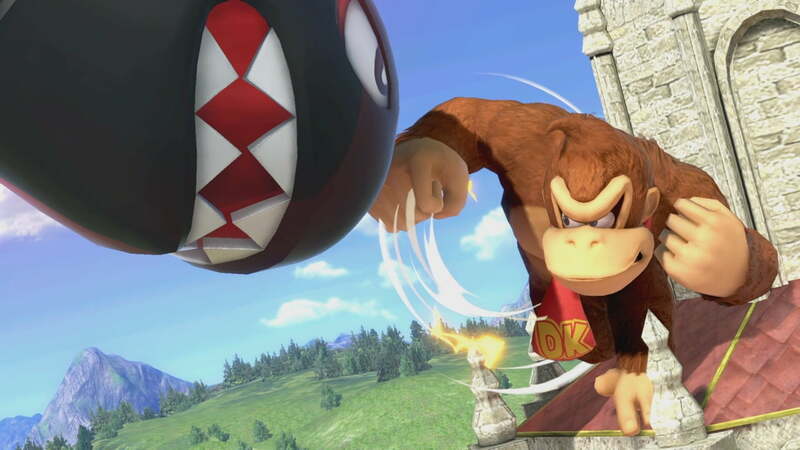 Firstly, Ultimate is a much faster Smash Bros. experience than some of its predecessors. For those who remember it, this feels much closer to the fast-paced fighting of Melee back on the GameCube than some of the slightly slower-paced offerings in recent years. Fighters also seem to have more mass, physically stopping if they collide rather than passing each other by seamlessly. 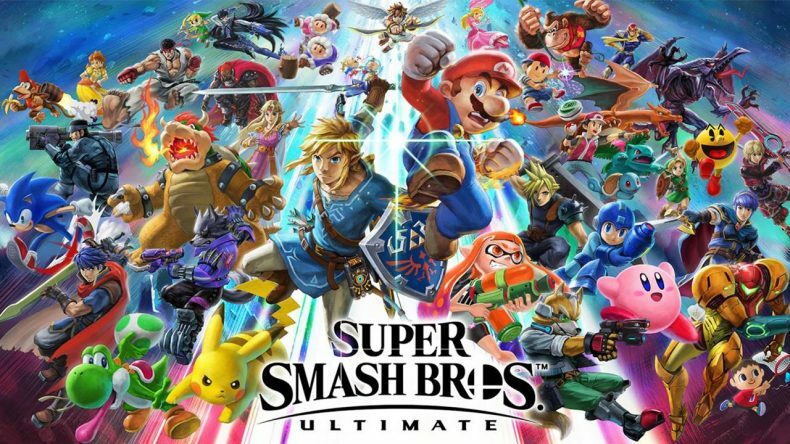 To newcomers these small changes will seem fair and normal, but to stalwarts of the series, they will be significant enough to create a different feel when playing Ultimate – but one that is certainly welcome as it looks to carve out its own identity. Speaking of identity, ever since it was announced, Ultimate’s pitch has always centred on sheer scale. As you’ll be aware from the many detailed Smash Directs showcased before release, this is the biggest Smash title yet. The largest character roster, the highest stage count ever, the biggest music library, more items, and more Pokémon and Assist Trophies than ever before. As a numbers exercise, it’s a marketer’s dream, but what’s critical is whether these impressive numbers represent a better experience or not. With a character count in excess of 70 when fully unlocked, it’s easy to assume that after a while it just becomes silly and unnecessary to have so many fighters to choose from. But it’s executed in such a way that it strikes a solid balance between reward and progression without ever feeling overwhelming. Most of the characters are unlocked after a certain amount of time spent playing the game, meaning at a fairly reasonable pace you’ll finish a mode, and a new challenger will appear who’ll be added to your roster if you beat them. You can also unlock characters in the World of Light mode, so either way, you’ll find your character selection screen filling up quite nicely after a few hours. And because it’s a passive occurrence, it never feels like a chore. All of the characters still feel unique, despite the move-sets being mapped to the same button inputs. 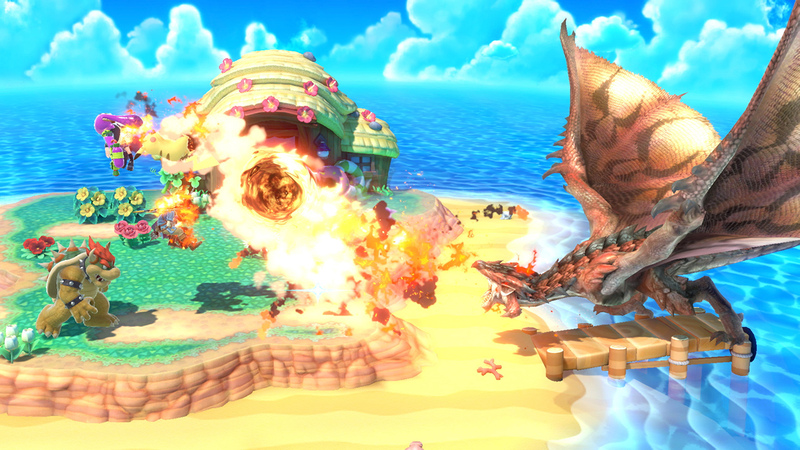 In fact, some of the new characters bring very interesting elements to the mix, with Ridley and King K Rool being particular highlights you’ll want to invest time in when they unlock. Despite everything being bigger in Ultimate, it’s actually the little touches and the slight nuances that make it stand out. In Classic Mode for example (the standard single-player, quick-play mode) every single character has a unique path to navigate through. That’s (currently) 74 different Classic Mode configurations, which will mean fighting different opponents to progress – and they even mix up the final boss battle at the end. So Link, for example, is on a quest to rid the world of darkness, and so fights dark enemies, culminating in a final battle with his arch-nemesis Ganon. Marth on the other hand is on a dragon-slaying adventure, meaning all of his opponents are dragons (or as close as the roster allows), with a final confrontation with a Rathalos from the Monster Hunter series waiting for him at the end. The beauty though, is that Ultimate doesn’t scream this from the rooftops. It leaves you to make the connections, join the dots, to see what direction the developers’ minds were heading in. It does mean some will miss certain clues and see this Classic Mode as a stack of simple bouts against arbitrary fighters until the boss is dead, and that’s a shame. But that said, there is an elegance to this restraint, leaving little hat-tips for ardent fans and eagle-eyed players, like trails of breadcrumbs that reward those with the patience and the franchise knowledge to spot them. And if there’s one thing Smash Bros. has always excelled at, it is celebrating the franchises it’s built upon. Honouring the best of Nintendo history, as well as select third-party contributions too, Smash’s secondary function has always been to showcase gaming history. Ultimate is no exception, and with even more franchises included this time around (such as Castelvania), it naturally feels like the most complete package. In previous Smash titles it has fallen to collectable trophies to remind us of games gone by, but in Ultimate there is a new twist in the form of Spirits. Each spirit will be a character from a game that will offer you boosts in battle, such as a starting item or increased attack power. With this simple collectable tweak, suddenly they have more purpose than before. Now, rather than just being a reward that sits on a virtual shelf, there’s a purpose to collecting spirits that both casual players and completionists can get behind. You’ll find yourself looking to collect as many Spirits as you can because of the bonuses they give to help you during a particularly difficult bout. 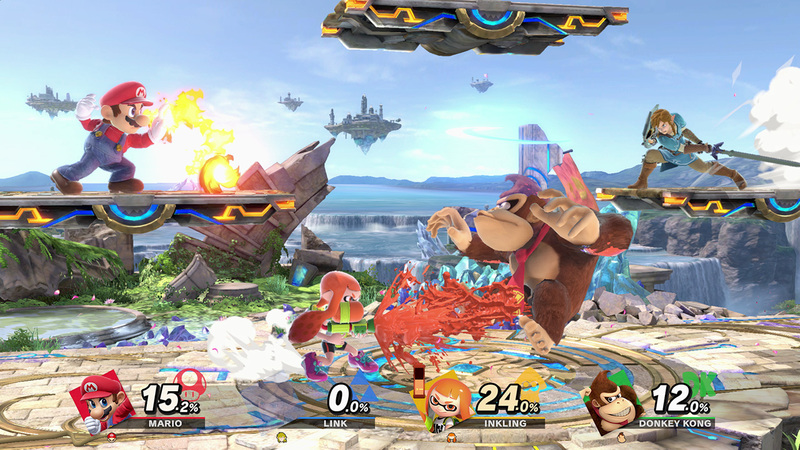 Spirits can be used in multiplayer Smash battles if you include them as part of your rules setup, but the main place where they will be utilised is in World of Light, Ultimate’s single-player adventure mode. In more of a return to the Subspace Emmisary mode of Brawl – and thankfully ignoring Smash Tour from the Wii U version – you are tasked with taking down the evil character Galeem. Unfortunately almost all of the Ultimate fighters have been turned into dark puppets, with the exception of Kirby, who is your sole starting character. You traverse a world map overcoming various spirits that have also been corrupted by Galeem, and beating them adds them to your collection. Occasionally you’ll also encounter fighters to beat and add to your World of Light roster, giving you more options. Also, If you unlock them in this mode and hadn’t previously unlocked them in other modes, they will be added to your roster there too. As you amass Spirits, you start to learn and appreciate the depth in their creation. There are both primary and support Spirits, each providing different benefits to your fighter when used, some of which are essential to overcoming specific battles scattered across the world. As you fight and win with your selected Spirits, the primary Spirits also level up, which is necessary to combat more powerful Spirits that offer even better bonuses if you manage to beat them. As such there is a real sense of progression, not only from a willingness to save your favourite characters and defeat Galeem, but to see which Spirits you can unlock, and then balance to create the perfect loadout for your fighting style. The attention to detail shines through again as every battle against a Spirit is carefully chosen to best represent that game character. To unlock the Wiggler spirit for example, you’ll face off against a Yellow Yoshi, or to unlock a spirit character from 1080 Snowboarding, you’ll face off in an ice arena, with Freezie items falling from the sky. When you consider that there are 1,000 Spirits available to unlock, it’s hard not to appreciate the thought and effort that went into this game. There are also Shops where you can buy Spirits and items, gyms and dojos where you can train Spirits to be stronger, or expeditions that you can send Spirits off on to look for treasure while you’re battling. There are mini dungeons to explore and mini-bosses to overcome all while getting ever closer to taking down Galeem. I was playing it on Normal difficulty (Easy and Hard Modes are also available), and it took over 25 hours to get through, and that wasn’t doing absolutely everything on offer. Progress is fairly well-paced, and you’ll often find yourself in that “one more fight” mentality that can easily while away the hours. It’s true, though, that there is less story here. Whereas in Subspace Emissary battles were often strung together by cut-scenes of your favourite characters progressing their journey, here it’s all managed through you moving round the over-world, and that feels more solitary as a result. However, the battling is the primary focus, and the attention to detail there is phenomenal, and the well-designed Spirit mechanic just adds to the experience, making World of Light a return to form for Smash adventure modes. Multiplayer will undoubtedly command large chunks of your time, and as you would expect, there’s an array of modes to choose from. In keeping with Ultimate’s approach, it includes some old favourites and adds in some new ideas to give a rounded experience. In terms of standard Smash battles, the amount of customisable options is incredible. Handicaps, item selection, even who gets to select the arena, can all be tweaked to suit your preferences, and then handily saved as a pre-set for those who want to set up a match quickly with a specific set of criteria. As well as the welcome return of Tourney mode, there are two new modes: Smashdown, where after each battle the characters used are removed from selection, forcing you to switch up who you fight with; and Squad Strike, which enables 3 vs 3 or 5 vs 5 tag team battles, to mix up proceedings. Both work particularly well, with Smashdown in particularly providing some great local multiplayer banter when you select and lock out a character an opponent wanted to play as. It’s a great reminder that at heart Ultimate is a party game and can be at its most fun when huddled around a TV (or Switch if you’re feeling particularly intimate), and you’re enjoying the experience with friends. From a technical standpoint, Ultimate is also by far the smoothest Smash Bros I’ve ever played. In all the single-player modes, I’ve never experienced any slowdown in a match, or any drop in performance. The loading times as well are short and relatively unnoticeable meaning you’re back in the thick of the action before you know it. 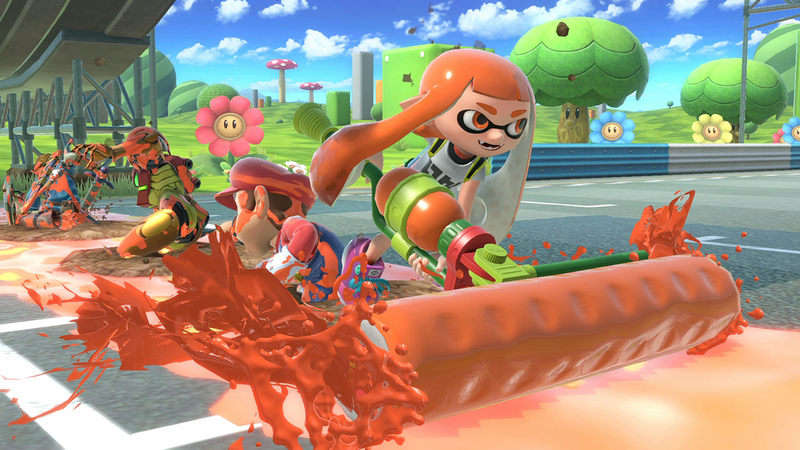 Even in 8-player local multiplayer, with items everywhere and Assist Trophies and Pokémon frequency set to the highest setting, everything still runs as smooth as butter, without a hint of lag. Which, when you consider everything that is happening on-screen and how good it looks, is quite an achievement for Nintendo’s hardware. At the time of writing the online multiplayer functionality wasn’t available, so this review will be updated after launch day when we’ve spent some time in this area. But based on what I have seen so far, the early indications are extremely positive. These days, the titles of Nintendo’s big-hitting games seem to carry more credence and purpose than they ever used to. Since the birth of the Switch, Nintendo have adopted a more selective approach to their titles, to better express the experience you can expect. Super Mario Odyssey was perfectly named because it invoked a truly memorable journey full of adventure, and in Breath of the Wild you had a name which, for the first time, wasn’t about an item or place, but about how the game was intended to make you feel. And with Super Smash Bros. Ultimate it’s easy to see the recurring theme. An ultimate experience it most definitely is, bringing together the familiar and moulding it with the new to create a Nintendo game for the ages, an amalgamation not just of ideas and intellectual properties, but of years, of decades of beloved franchises. Packed with content and neat little touches, this is the best Super Smash Bros. has even been, and it’s so much more than just lip service; this is in every way an enduring love letter to Nintendo’s fans, both young and old.